Shacks in Kibera. For a long time, there were no sewerage services, no garbage collection and no police but it has changed gradually. A run-down area of a city characterized by substandard housing and squalor and lacking in tenure security(UN-HABITAT United Nations). This definition applies to kibera the biggest slum in the Kenyan capital, Nairobi . The proliferation of slums in urban areas is indicative of urban poverty. I would like to characterize the problems associated with occurence of slum dwellings in East Africa by using the existence of kibera slums, Nairobi, as my focal point. The history of the Kibera slums reads like this: It began as a settlement for Nubian Ex-soldiers who had been part of the KAR (King’s African Rifles) British World War 1 effort. 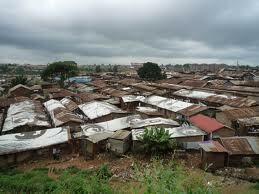 After the war, they were granted land on which to settle and this is what later became kibera. At that time the area was still forested and the Nubians called it ‘Kibra’, Nubian for forest. This was however only a grant, not ownership due to the fact they did not obtain a title to the land. The structures that were built served the Nubians as sources of income through rent. Subsequent populations arrived and the settlement grew. In the 1970s, the Nairobi city government removed building restrictions, an act that encouraged the sprouting up of numerous structures overnight. This led to an influx of new rent-paying residents and the growth of Kibera as a slum for those who sought basic accommodations. Over time, there developed ethno-based population clusters like the Kikuyu, Luo, Luhya etc, which later on grew into ethnic neighborhoods, all in Kibera. The growth of Kibera is an example of unplanned development one finds in third world cities. Kibera is classified by Nairobi City as “unauthorized settlement” with a population said to be between 300,000-1,000,000 inhabitants. Nairobi is a densely populated city, a fact that accounts for the immense pressure on land; rents are prohibitively high. This has prompted real-estate developers to build upwards and to build high. Thus one finds that majority of Nairobians live in flats or high-rises and this is true mostly for the outlying areas of eastlands and southlands regions of the city. The growth and expansion of Kibera slums has continued to the present day mostly because it continues to attract the blue-collar, low rent variety of residents. This is not worthy of note to the casual observer passing through the area but a more analytic eye reveals the ‘other reasons’ that attract new residents. Slums generally start up as temporary, semi-permanent settlements a fact which ultimately determines the choice of building materials, forming myriad styles of dwellings. These range from the simplest cardboard shacks, to structures of wooden polls and tinned roofing or adobe and wattle(mud with grass thatching or corrugated sheets for roofing). Thus the quality of the buildings is what classifies a slum as such and almost all slums are located near cities to take advantage of proximity to sources of employment and also ease of access to markets, schools etc. Kibera’s workforce consists of low-skilled rural transplants who arrive with minimal qualifications and no industrial skills. 50% of the workforce is employed by Nairobi’s industrial sector near where they live and they do mostly semi-professional work consisting of construction labor, manufacturing-fabrication(welding), carpentry, craftmanships e.g car repair etc. There are many who become skilled artisans and these start up their own side businesses and form part of the economy of kibera. There are other economic activities such as petty trading(grocery stores, household items, artisan products). The problems in Kibera are the problems of slum dwellers everywhere: vagabondage, alcoholism, drug usage and abuse, thefts, forgery, prostitution, criminal syndicates, petty crime and all vices found in areas of low social expectations. There was no running water in Kibera for a long time but The World Bank has helped with that and there is some areas with access to clean water now. There are officially no municipal services-no garbage collection, sewarage system, health centers, drainage etc. Thus there are periodic disease outbreaks such as Cholera. Recently, the government has instituted a “slum upgrade” project in conjunction with the UN-HABITAT and other well-wishers to build permanent structures in which the Kibera residents can be relocated. It is a planned settlement with running water, Electricity, Garbage collection, shopping areas etc. Those who hope to live in the new housing will be required to pay minimal rent. With such good news, one is tempted to heave a sigh of relief but alas! There are those who see loss in these developments-the landlords who will lose tenants. I will still say thanks to those doing a commendable job.